Cooneen / An Cuainín [LL] is a townland in the parish of Dolla. The recess referred to may well be the narrow defile with waterfalls on the SE slope of Cooneen Hill. Cooneen Hill is the 670th highest place in Ireland. Picture from group : Cooneen Hill from NE approach road. 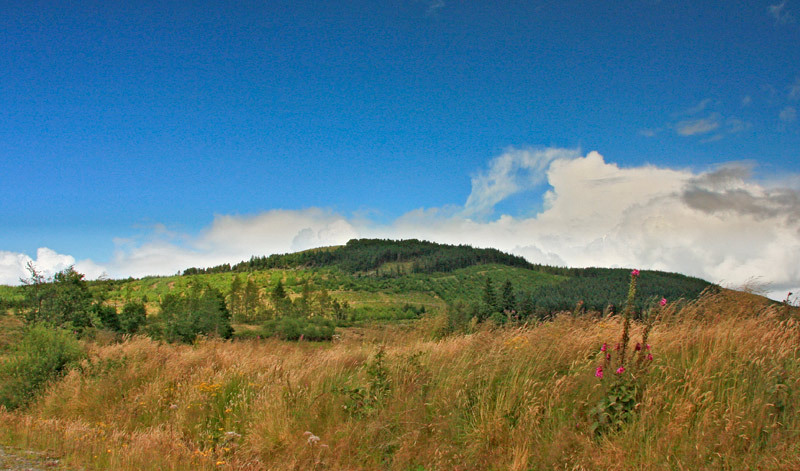 Picture: Cooneen Hill from NE approach road. Start from the forestry entrance at R90294 66782 A and walk uphill, taking two lefts and one right off the main track onto a very rough track thats almost blocked near the end with felled trees, to R90538 68028 B. A rough but managable push to the left through the trees and undergrowth will bring you to open bog and the heathery summit cairn. Return the same way. Another route is from Lisgariff East at R919 692 C.